Recently, a friend of mine came in to visit from out-of-state. We were surfing the net trying to find some fun things to do around here when we came upon this site. Since neither of us really had any stories of our own to tell, we decided to go in search of some. We gathered up a camera and some film and set out on our expedition. We visited a few places that were said to be haunted and took some pics, but by midnight we had yet to see anything out of the ordinary. A stop at the local Citgo for a fill-up lucked us into running into a friend of ours, who is known to us for her own interest in ghosts and their stories. We got on the subject of a local Urban Legend here about “The Ghost at the Swimming Hole Bridge”. None of us knew for sure the story behind this ghost. But, it is said, that if you park on the bridge after dark, turn off the engine, and sit in complete silence, you will hear/see (we weren’t really sure) the ghost of an Indian warrior. In a few moments time, we were heading in the direction of the bridge, which happens to be about 5-10 miles back in the woods. Throughout the night I had successfully wandered through cemeteries and stood before “haunted” houses without freaking out. But as we got closer to the bridge that little voice in my head kept telling me to turn back. My friend, however, couldn’t wait to get there, and so I drove on. Finally, we reached our destination. I parked the car and turned off the engine and lights. From my window I could clearly see the swimming hole that was illuminated by the light in the parking lot of a nearby church. From the window of my friend however, the view was pitch black. After waiting in the silence for a few minutes, my friend suddenly let out a loud “Whoo”, sounding very much like an Indian to me, and provoking a sound punch in the arm. My friend then took a few pics out of his window and we were just getting ready to leave when I shared a thought I just had. Somewhere before I had heard that some didn’t like to have their picture taken because they believed that it captured their soul. Then something happened. At that moment I wasn’t sure what that something was. At first I thought the car had died, then I remembered the engine was already killed. I turned the key and punched the gas, the car sprang to life, and we sped onto the dirt road heading deeper into the forest. My friend finally convinced me to turn around and as we shot back over the bridge we realized the something that had happened had been the light at the church going out. We laughed nervously at ourselves, headed for a few other “haunts”, took some pics, and called it a night. Now, this may seem like the boring end to this story (and as long as it has been, you’re probably hoping so). But I haven’t told you about the pictures. We got back some weird stuff from some of the cemeteries and houses, but the weirdest of all was the one picture that we got back from the bridge. In the picture you can see the outline of some trees, the reflection of the flash on the water, and something else. 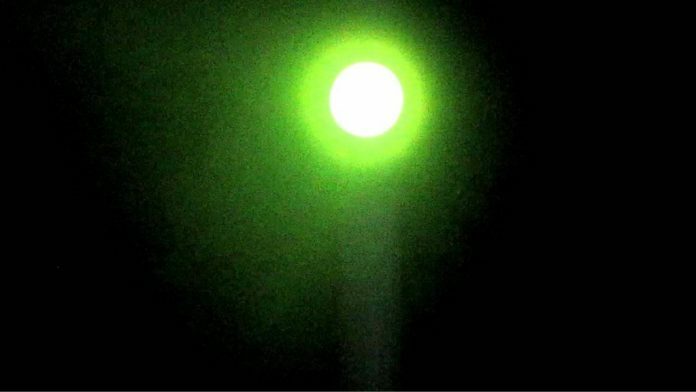 Something was hovering just outside of my friend’s window, which was a bright globe of green light. And as for the pictures we took after the bridge, I wouldn’t know. They never came out!